Some inventors have come up with ideas that never quite caught the public imagination. In the 1960s, the inventor John Rinfret demonstrated an anti-theft bag. His idea was to stop thieves stealing the contents of bags used by business people. With the anti-theft bag, the owner pulled a chain in the event of an attempted mugging. The contents then fell out of the bottom of the bag. The drawback was that the contents dispersed across the pavement or blew away in the wind. In the 1930s there were worries that babies in London were not getting enough fresh air. One answer was the baby cage. This was a square cage that parents hung outside the window of a flat. The side of the cage facing the window was open. A parent would place a baby inside the cage and leave it there to play or sleep, even though the cage hung over a street. Cigarette holders were once popular smoking accessories. Robert L. Stern took the design of such holders a stage further by creating one that had a tiny umbrella suspended over the cigarette. This made smoking in the rain easier. Some inventors like to create new devices for pets, particularly dogs. One such invention appeared in the 1940s. It was a large pair of wooden, expanding tongs that an owner could use to grasp a dog and restrain it. The tong wielder had to be close to the dog, however. Close enough in fact to attach a lead. The major tyre maker, Goodyear, launched illuminated tyres in 1961. The tyres were remarkably bright but were not one of the tyre company’s most popular ideas. The phone has seen all manner of ideas and developments over the last hundred years or so. One of the most unusual was the laryngaphone from 1929. Rather than speak into the phone, the user placed a circular unit against his or her throat. This unit picked up vibrations from the vocal chords. The purpose was to eliminate the background noise that interrupted conversations on a normal phone. During the 1960s, many inventors were keen to explore the possibilities of robots. In 1964, Claus Scholz created a robot that could make its way to a ringing phone and pick it up. But the robot couldn’t speak into the phone or record a message. A few years earlier, another inventor produced a robot with a quick-draw right arm for firing a gun. Again, the robot had limited use. TV technology could not have progressed so rapidly without the interest and work of inventors. Hugo Gernsback‘s contribution was to strap a small TV receiver across his eyes. The controls of the TV were on the back and side of the receiver, and two aerials protruded from the top. His invention, from 1963, is the most private TV ever conceived. 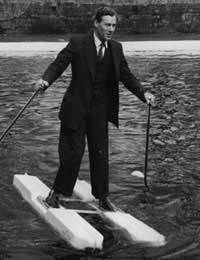 Various inventors have produced ideas for walking on water. M. W. Hulton’s sea-shoes of 1962 were two ski-like floats joined together. To work, the sea-shoes needed a means of propulsion and a calm day.